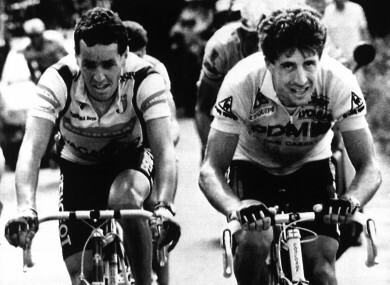 Stephen Roche, left, rides shoulder to shoulder with Pedro Delgado during their 1987 battle. After a tug-of-war over the yellow jersey, Fignon came down from the Alps with the upper hand, leading his American opponent by 50 seconds going into the last stage – a 25 kilometre individual time trial from Versailles to Paris. Email “The Magnificent Seven: Le Tour’s finest battles”. Feedback on “The Magnificent Seven: Le Tour’s finest battles”.